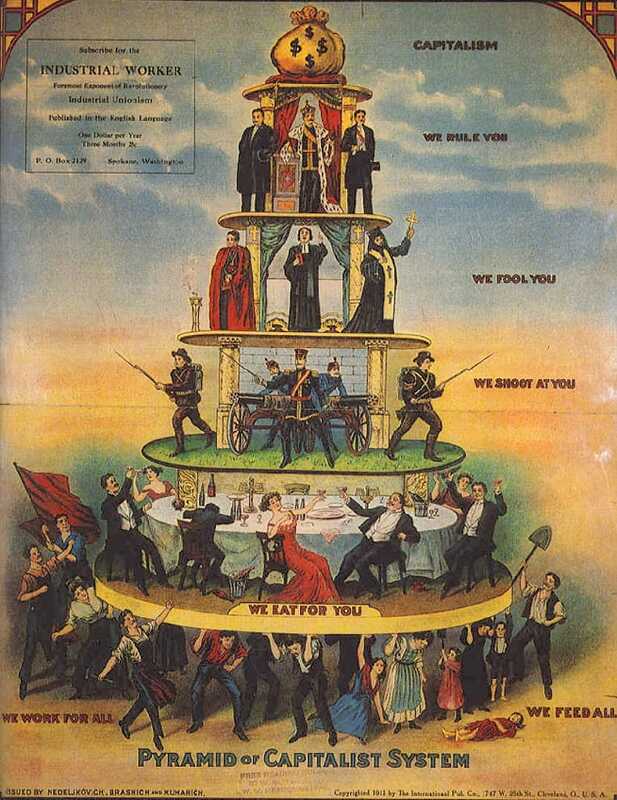 Pyramid of Capitalist System is an American cartoon critical of capitalism by depicting social class stratification and economic inequality, Industrial Worker, 1911. ​Before the Industrial Revolution at the start of the 19th century, Great Britain arguably had more in common with the world of Ancient Rome than the world of today. Factories and railroads powered by steam engines transformed the agrarian nation into the world’s first industrial powerhouse. City populations swelled as men, women, and children faced long hours and very little pay in often dangerous and polluted working and living conditions. Reacting to the exploitation of the workers by factory owners, Karl Marx wrote the Communist Manifesto which would become one of the most influential political treatises in history. By the century’s end, the steel, electric, and chemical industries and new inventions such as the camera, telephone, automobile, and airplane rapidly transformed society at the dawn of the modern world. Explain how physical geography and natural resources influenced industrialism and changes in the environment. Analyze the effects of industrialism and urbanization on social and economic reform. Evaluate key turning points of the modern era in terms of their lasting impact.